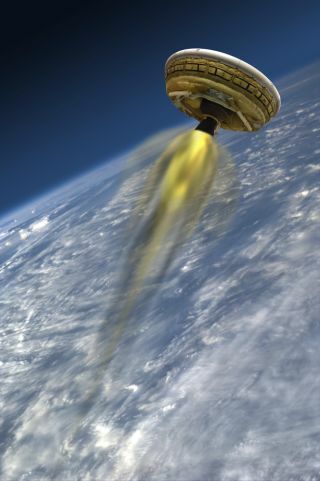 NASA hopes to launch its Low-Density Supersonic Decelerator (LDSD) test vehicle — which the agency has dubbed its own "flying saucer" — Thursday (June 5) from the U.S. Navy's Pacific Missile Range Facility in Kauai, Hawaii. The balloon-aided liftoff was originally scheduled for today (June 3), but the weather did not cooperate. The LDSD project is part of NASA's effort to put boots on the Red Planet 20 years or so from now. The program is developing and testing technologies — specifically, a 100-foot-wide (30.5 meters) parachute and two inflatable devices known as Supersonic Inflatable Aerodynamic Decelerators, or SIADs — designed to slow the descent of heavy gear such as human habitat modules through the thin Martian atmosphere. One SIAD measures 20 feet (6 m) across, while the other is 26 feet (8 m) wide. The devices are built to fit around the rim of entry vehicles like the one that helped NASA's Mars rover Curiosity land in August 2012, slowing them down by increasing their surface area (and thus their atmospheric drag). During Thursday's test, a huge balloon will loft a test vehicle equipped with the 20-foot SIAD and the monster parachute up to an altitude of 23 miles (37 kilometers). The vehicle will be dropped at this point, and an onboard rocket will boost it to Mach 4 (four times the speed of sound) and a height of 34 miles (55 km). "Our goal is to get to an altitude and velocity which simulates the kind of environment one of our vehicles would encounter when it would fly in the Martian atmosphere," LDSD principal investigator Ian Clark, also of JPL, said in a statement. The SIAD will inflate, slowing the craft down to Mach 2.5. Then the parachute — the biggest supersonic chute every flown — will deploy, paving the way for what team members hope will be a soft splashdown in the Pacific Ocean. But the test will be instructive even if not everything goes according to plan, officials said. "We want to get that balloon to altitude, drop it and fire that [rocket] motor. And if we fire that motor and we get data back from it, that is a great day," Adler told reporters during a pre-launch press conference Monday (June 2). "That way, we can learn exactly what happened and understand what to do for our next flights." Those other flights should come next year. NASA plans to launch two more LDSD test missions from Hawaii in the summer of 2015.